Andie Collins is responsible for the marketing, communication and business development efforts for The Sheeter Group. In addition to strategic business development efforts, she directs media relations, branding, advertising and website development. She manages and oversees sponsorships, events, charitable contributions, marketing training and client interaction. She supports and assimilates market and peer research, summary reports and other specialty projects. Andie is a seasoned marketing professional and holds a Bachelor of Arts in Advertising and Broadcast Media from Georgia College. 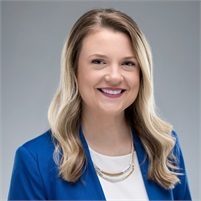 She began her career in the credit union world when she started working with The Sheeter Group in 2017. Prior to joining The Sheeter Group, she had a successful career working in the advertising industry at two major ad agencies in Atlanta — 22squared and Hearts & Science, a division of Omnicom Media Group. Andie currently resides in Woodstock, GA with her husband Nick.